Welcome to Stafford Music Academy! We are proud to say that we have helped bring music to hundreds of lives. 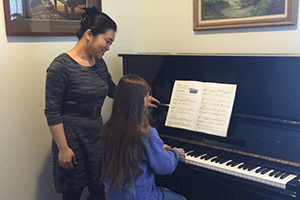 The Stafford Music Academy is committed to providing high-quality music lessons in Bloomington, Indiana. Established in 2005 by Bloomington native Christopher Stafford, the Stafford Music Academy is now owned by Jessica Harris. We are proud to say that we have helped bring music to thousands of lives. 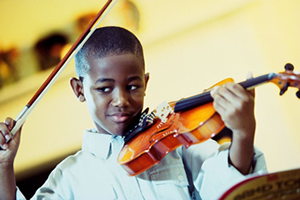 Our instructors' priority is to get to know you or your child personally so that they may tailor-fit the music lesson to your needs and desires. Some of our teachers are professional musicians, while others are current or graduated students of Indiana University's esteemed Jacobs School of Music. All teachers have passed extensive screening and background checks and are locally famous for going "the extra mile" for their students. Just check out our testimonials to read some of the rave reviews our teachers garner! We currently offer lessons on piano, guitar (acoustic and electric), bass (upright and electric), drums, violin, viola, cello, flute, clarinet, bassoon, oboe, saxophone, recorder, voice, banjo, mandolin, ukulele, French horn, trombone, tuba, trumpet and euphonium. We are conveniently located on Bloomington's east side, right between Rogers-Binford and the College Mall. With such amenities as a large, free parking lot, free WiFi, two spacious waiting areas complete with magazines and kids' activities, and studio space that was designed and built specifically for music lessons (with extensive soundproofing), our facilities will not disappoint! For more information about what makes us stand out as the best place for lessons in Bloomington, please see our page, Why choose Stafford ? 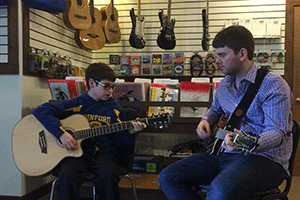 At what age can my children start taking music lessons? We know that every child is different, but generally speaking, students are ready for private lessons by around age 5 or 6. Some students are ready at a younger age, but if they cannot sit still and focus for more than 15 minutes at a time, they will find the private lesson format to be frustrating and perhaps even scary. We recommend for children younger than 5 to look into our “Opening Acts” classes. We offer these classes throughout the school year and summer. 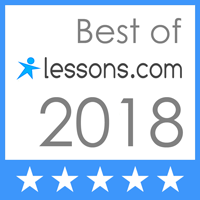 Also, for students who are under 5, we offer free 15 minute-long trial lessons in which our instructors can evaluate students’ readiness for lessons. If students’ attention spans are short, we offer 15-minute lessons for $10 each until the student is ready for 30-minute lessons. What instrument should my childen start lessons on first? 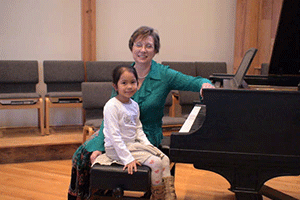 Without hesitation, we strongly feel that children should begin their musical journey on the piano. Because so little initial effort is needed for simple tone production, students can immediately get satisfaction playing tunes and pieces they will recognize. 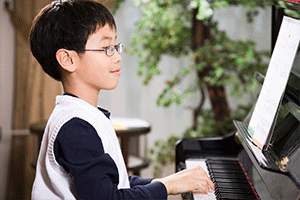 In addition, after studying piano for several years, students can then proceed to many other instruments with ease. In a rare few exceptions, a prospective student has decided that they are interested ONLY in playing the violin or the guitar, for example. If the student's motivation is so obviously instrument-based, we of course will encourage the student to follow his/her passion. Because there are many sizes of violins, cellos, drumsets, and guitars (and ukuleles! ), we can accommodate most students' interests. 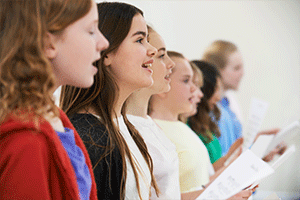 How much are students expected to practice each week? Again, we know that each child is different. 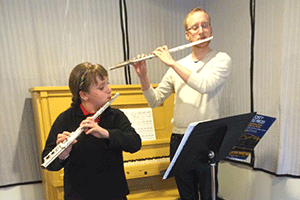 For many students music is the highlight of their week, while for others it is one of many activities. Students are definitely expected to practice throughout the week in order for their lessons to be effective. Some will practice as much as an hour each evening, while others may only practice two or three times per week. 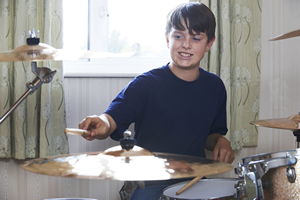 At the beginning it is very important for parents to make sure students are practicing. Otherwise, students will not progress and will become frustrated during the lessons (as will the teachers!) This often starts an unfortunate cycle where the student gets bummed, practices less, makes less progress, and gets more bummed. Fortunately, parents can help turn the cycle the other way by making sure students get regular practice. This will result in greater satisfaction, moving on to new pieces, and feeling a wonderful well-earned sense of accomplishment!